A burger assembled with loving care, just like your Mama would do it. 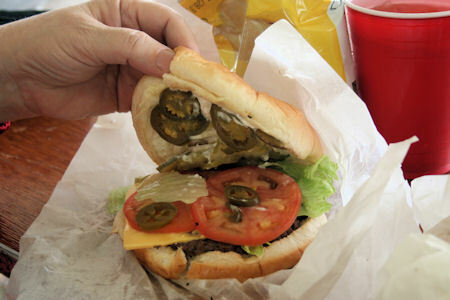 A Jalapeño Cheese Burger, just like you like it. You wont find these at McDonalds. I normally review town square restaurants and out of the way café's but there is one food venue that I have a lot of experience with but never have mentioned it on these pages. That is county fair / festival food. I'm not talking about strawberries at the Poteet strawberry festival or any food directly related to the event but real "Fair" food that is sold out of a kitchen that doubles as a horse trailer the rest of the year. 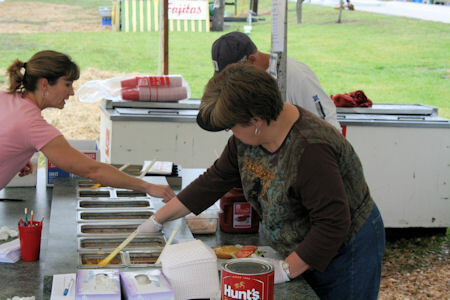 There are different classes and even some subclasses of "Fair" food such as food on a stick. There is sausage on a stick, cob corn on a stick, corn dogs, on a stick, all on a wooden stick. Then there is the sub class with a natural stick such as turkey legs. I think the idea here is that it requires no plates or eating utensils. After that comes Kettle Corn, Nachos and that favorite over priced junk food funnel cake. I once had a friend that retired from a good paying job, bought a funnel cake trailer. He dragged it all over Texas making all the fairs and festivals both large and small and now is a wealthy man from just selling funnel cakes. 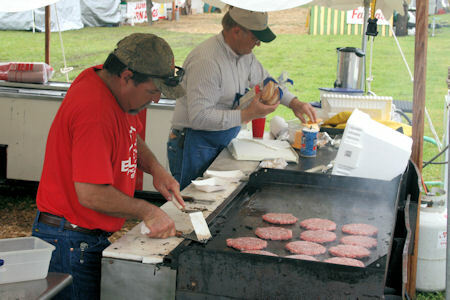 Look for the food booth under a tent that has homemade barbeque pits gathered around one side. The one that looks like the tables and chairs came out of the First Baptist Church fellowship hall. Look for the one whose cooks and servers look like your Mama and your family. I was at the Burton Cotton Gin Festival last week and this is just what I found. A great jalapeño cheese burger just like you would make it home.